The National Search and Rescue Secretariat presented their annual Outstanding Search and Rescue Achievement Award as well as four Certificates of Achievement in SAR on October 20 in Victoria, British Columbia. 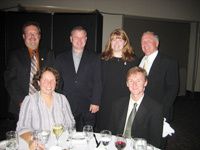 The presentations were made at an awards banquet which closed SARSCENE 2007, the annual SAR conference. The Outstanding SAR Achievement Award for 2007 was awarded to the Canadian Coast Guard Rescue Specialist Coordinators Working Group. Sarah Hughes (NCR) and Dave Griffiths (N&L).